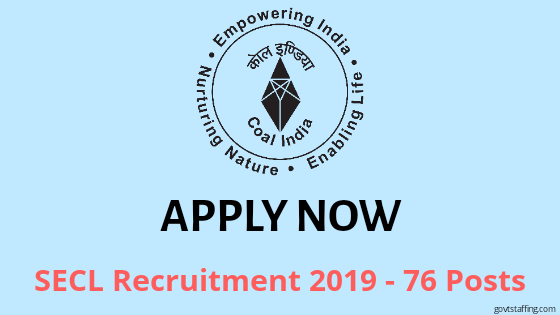 SECL Recruitment 2019: South Eastern Coalfield Limited(SECL) has post a notification on 02/02/2019 carrying 76 Mining Sirdar, Deputy Surveyor Vacancy. Interested and eligible candidate should grab this golden opportunity. Interested candidate have to fill an online application form via official website of SECL. 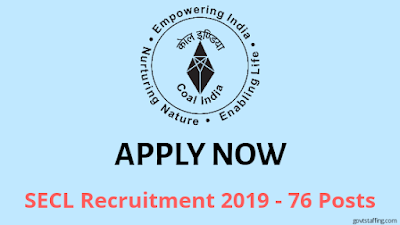 SECL Recruitment 2019 has invited a new 76 employees for the post of Mining Sirdar, Deputy Surveyor. SECL announced job notification to hire candidates who completed 10 th,Diploma for the vacant position of Mining Sirdar, Deputy Surveyor. This is a great announcement for all eligible candidate to chase this golden opportunity. The candidate have to be scheduled for the written test on the basis of this the selection of the candidate will be proceed. The candidate have to submit an online & offline application form along with self-attested copies of certificate/testimonials in support of age,education/technical/statuary qualification, caste, experience and three copies of recent passport size photograph(01 should be affixted) attested by Gazetted officer should reach to the General Manger(P/MP),SECL, Seepat road, Bilaspur(CG), Pin-495006 through Regd. Post on or before 28/02/2019. Below we are elaborating all the important details regarding the post i.e Vacancy details, How to appy, Dates to be remember. South Eastern Coalfields Limited(SECL), a subsidiary of Coal India Limited with the path of government of india engaged in Coal Mining activities in Chhattisgarh and Madhya Pradesh has invited indian young individual for the filling up the form for the above mentioned post. The candidate should fulfill the required qualification.It includes all the distribution of vacancy. As per SECL Recruitment 2019 norms the vacancy is further distributed in different post according to the Qualification. A great for the aspirants with multi options to catch this opportunity. Eligible candidate must grab this golden opportunity before the last date i.e 28-02-2019. Candidate should be updated with the official website so that no important dates is missed. The criteria which has been undertaken by the committee in order to fill the application form. Like age limits, educational qualification and many more.The candidates should check their eligibility criteria before filling the form.The committee has decided 28-02-2019 to be the last date for the form submission.Therefore the candidate should check their eligibility criteria before filling the application form. South Eastern Coalfields Limited(SECL), a subsidiary of Coal India Limited with the path of government of india engaged in Coal Mining activities in Chhattisgarh and Madhya Pradesh has invited indian young individual for the filling up the form for the above mentioned post. The candidate should fulfill the required qualification.It includes all the distribution of vacancy. Matriculation or Equivalent Examination passed from government recognized board. Valid over man certificate of competency granted by DGMS, Dhanbad or any other certificate of competency in Mining issued by DGMS, Dhanbad or any other certificate of competency in Mining issued by DGMS, Dhanbad which entitles the application to work as Mining Sirdar as per CMR, 1957. Valid first Aid and gas testing certificate. Minimum age should be 18 years as on 28/02/2019 and maximum age is 33 years for OBC and 35 years for SC/ST as on 28/02/2019. Selection process is that process which the committee has approved or set to select the candidates. According to SECL Recruitment 2019 the candidate will be select on the basis of Written test. The candidate have to fill the application on or before the last date i.e 28-02-2019.  All important date, time and venue for examination/interview will be intimated to the eligible candidate in due courses as well as such information will be also available in the official website of South Eastern Coalfields Limited(SECL) l- Click Here. to check the official website. Besides the basic pay the posts carry other allowances and fringe benefits as per company’s rules and regulation. Candidate can fill the application form through online/offline mode via the official website of SECL. Candidate should send their application within proper method, so that it reach in a proper manner. The SC/ST candidate should posses proper required documents with certificate. Address and Last date:- The General Manger(P/MP),SECL, Seepat road, Bilaspur(CG), Pin-495006 through Regd. Last date -28/02/2019. SECL Recruitment 2019: How to apply? For online applications the candidate have to go through the official website of SECL(www.secl.gov.in) which will be open from 01/02/2019 to 20/02/2019. After applying to the mentioned post the candidate have to take a print of the form and attest it with a space provided for further references. The candidate have to submit an online & offline application form along with self-attested copies of certificate/testimonials in support of age,education/technical/statuary qualification, caste, experience and three copies of recent passport size photograph(01 should be affixted) attested by Gazetted officer should reach to the General Manger(P/MP),SECL, Seepat road, Bilaspur(CG), Pin-495006 through Regd. Post on or before 28/02/2019.